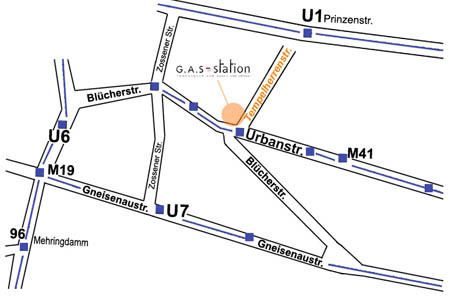 G.A.S - station is situated in the Tempelherrenstrasse in Kreuzberg, on the corner of Blücherstrasse/Urbanstrasse. Easy to be reached by public transport. Bus M41 that passes at the new main trainstation, stops right in front of the entrance. Subway/Underground stationes are near by, U1 Prinzenstrasse, U6 Hallesches Tor and U7 Gneisenaustrasse about 7 min walk. By car or bicycle through Carl-Herz-Ufer, Johanniterstrasse oder Wilmsstrasse. The Tempelherrenstrasse is a dead-end street.